inside of which incredible things can happen. 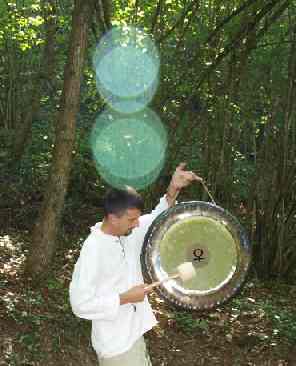 The sacred gong is the spirit which sings, and releases the chains of the personality. bringing them more and more into harmonic connection. all this brings strength, peace and healing. too often constrained and, more precisely, forgotten. for its extraordinary power of evolutionary transformation. which at times, seems the song of a great OM. The sounds sweetly lead us into a state of deep realxation, halfway between asleep and awake...like when we are about to fall asleep, and our subconscious begins to produce dreams, yet we are still alert and thinking. Conscious and subconscious life experiences can emerge, thereby making it possible to free the self from tensions, contractions and inner blockages. Every single cell in the body is sweetly massaged and stimulated to re-harmonize. People who see auras say that initially you see a dark blue similar to that of anaesthesia, which corresponds to the stage in which the sounds that lead to a deep state of relaxation are made... there then follows a cleansing phase on a subtle level, with the colour green, and finally come violet and gold: the energies of the divine descend on the persons present. 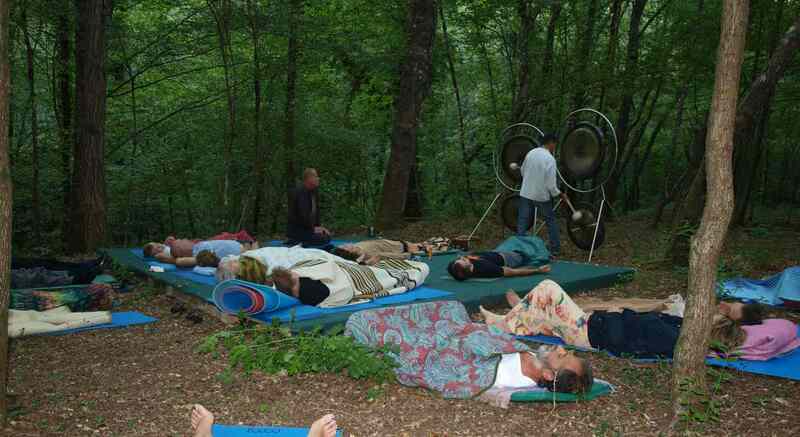 At the end all the auras of the participants are even more homogenized, radiant and united. It can increase the consciousness of the self; creativity and productive force are positively influenced. Self-healing powers are reinforced and thereby produce a new zest for life. Often we allow ourselves to live beyond the limits of the physical body, like for example feeling raised up, suspended in mid-air, or else thrown down on the ground, becoming the Earth. One can feel that time is suspended, and an hour of sounds seems to have lasted only 10 minutes. The subconscious produces images and sensations useful to its own evolution...just like at night when dreams give shape to subconsious life experiences, and this fundamental activity, allows us to live our life every day. On a physical level, some feel long forgotten physical pains, which return during the session, to then be finally released. Some feel vibrations, in various parts of the body, according to the different sounds. On an emotional level, some feel moved, or, finally, after many years, hidden hurts emerge, which have engaged our vital energy for so much time... some laugh, contacting emotions of happiness. On a spiritual level some have intuitions and find solutions to situations in their lives. Some resonate, contacting higher emotions like a deep joy, a sense of union with all beings, with the Whole. Some have experiences of discomfort which are however very often released and lead to having more energy at one's disposition in the following days and to sensations of great peace or great strength. Some get bored! ...and feel like nothing is happening! In reality, the information contained in the vibrations is transmitted at all levels and these people, at least, can feel the vibrations in their body, like a real and true massage. 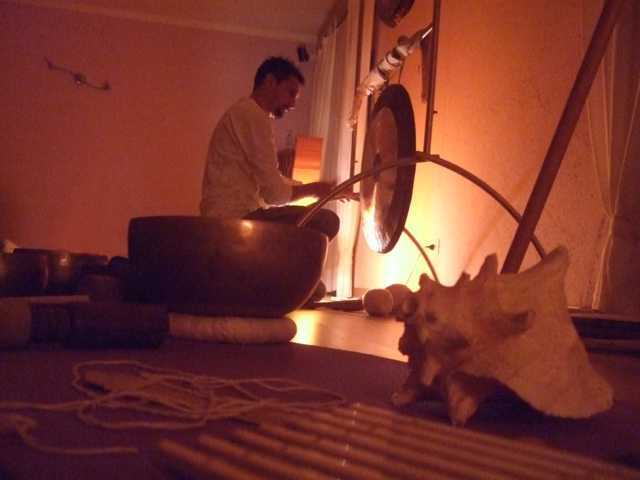 For everyone, however, there is the chance to learn to let themself go, in the Sound Bath, as in life, to a deeper level of trust... it is one of the many ways through which we can learn to be ready for everything, finally, ready for anything. With time, the perceptions of the vibrations sharpen, and the listening becomes deeper. In my sessions I use the planetary gongs of PAISTE. In the universe of Gongs they are the most expensive, but also the most harmonic and sonorous. They are tuned to the planets of the solar system, each one acts in particular with determined energies. My 5 Gongs: Sun, Mercury, Earth, Venus by PAISTE, and a 27-inch Stagg Gong. SUN: to develop a dynamic strength of will; to improve the spiritual life; to make decisions. MERCURY: to reinforce self-knowledge; to see together the whole and all its parts; creativity, comunication. EARTH: to lighten worries; connections to universal energy, to cosmic love. VENUS: To heighten art and compassion in love relationships; to expand the imagination and the ability to perceive and project. The evening consists of a short presentation and preparation, then everyone stretches out on their mat, wrapped in their own blanket, and lets themself go into this sea of deep vibrations that gush forth from this powerful instrument, from the harmonic singing, from the Tibetan bowls and from other ancestral musical instruments. At the end there is a moment in which you can draw or describe the sensations or visions that you had. Finally there follows a moment of sharing in which anyone who wishes can tell the rest of the group what happened during the session. It takes a month for the cells to integrate the harmonic information received by the sounds, so for this reason the rhythm is monthly. It is also possible to have individual sessions by appointment.